Check the engine coolant level by observing the “f” and “l” lines on the engine coolant reservoir tank. If the level is below the “l” line, add engine coolant to the “f” line from the engine coolant reservoir tank filler (1) behind the right side cowling. Refer to “exterior parts removal and installation” in section 9d . 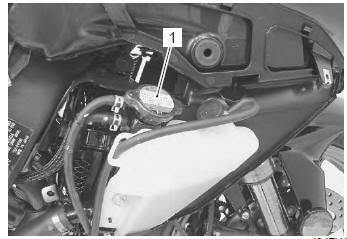 Refer to “engine coolant description” in section 1f . the radiator cap when the engine is hot, as you may be injured by escaping hot liquid or vapor. Engine coolant may be harmful if swallowed or if it comes in contact with skin or eyes. If engine coolant gets into the eyes or in contact with the skin, flush thoroughly with plenty of water. If swallowed, induce vomiting and call physician immediately. Remove the right side cowling. Refer to “exterior parts removal and installation” in section 9d . Remove the radiator cap (1). 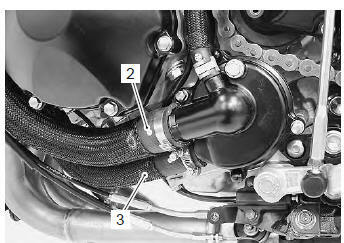 Drain engine coolant by disconnecting the radiator outlet hose (2) and cylinder inlet hose (3). Flush the radiator with fresh water if necessary. Pour the specified engine coolant up to the radiator inlet. Bleed air from the cooling circuit. After changing engine coolant, reinstall the removed parts. Remove the side cowlings. Refer to “exterior parts removal and installation” in section 9d (page 9d- 6). Add engine coolant up to the radiator inlet. Slowly swing the motorcycle, right and left, to bleed the air trapped in the cooling circuit. Start up the engine and bleed air from the radiator inlet completely. Repeat the procedures 5) to 6) until no air bleeds from the radiator inlet. 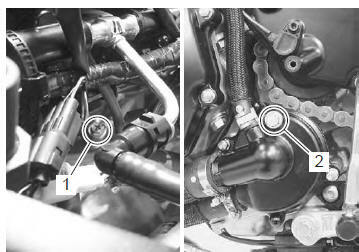 Loosen the air bleeder bolt (1) and (2), then check the engine coolant flows out. Tighten the air bleeder bolt. Close the radiator cap securely. After warming up and cooling down the engine several times, add the engine coolant up to the full level of the reservoir. make sure that the radiator is filled with engine coolant up to the reservoir full level. Check the radiator hoses for crack, damage or engine coolant leakage. Refer to “water hose inspection” in section 1f .